Denise dries off after a day of swimming at GabGab Beach on the Navy Base. For more pictures from Guam, click here. Every day, I wake up to a beautiful sunrise on a tropical island, spend my day lounging by the beach, enjoy the comforts of a safe and air conditioned house with internet every evening, and sleep in a soft warm bed at night. I’m tempted to say that anyone who gets to enjoy the comforts of Guam is blessed. Despite this, there’s another side of things here. It might be because I’m staying with a navy wife and spend my time hanging out with navy wives, but happiness seems fleeting and temporary. Denise has told me that the navy wives are catty gossips who spend most of their time fretting about their husbands. Certainly, some are sane, but it seems most are unhappy and obsessed. And with the lives they lead, being obsessed is easy. 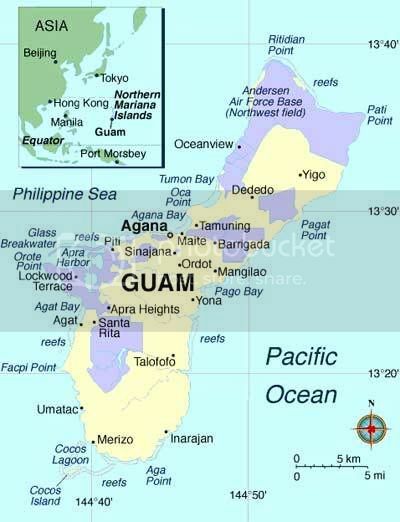 Guam is a small Island. It’s 30 miles long and ranges from 4 to 9 miles wide. Even including military personnel, there are only 160,000 people on island. In addition to Andersen Air Force Base in the North and Big Navy (the Navy base I’m on), there are 15 villages, including the capital Agana (or Hagatña) and the touristy downtown area of Tamuning (Tamuneng). The local Chamorro people have kept their language alive and have their own spellings for most cities and places, though they’re just like everyone else otherwise. If you are living on base, getting off base can be a chore. The security at the gate is tight, with full ID checks. For someone like me, who doesn’t have a military or dependent ID, I need a 30-day pass, which takes 10-days to process. In the meantime, any time I go off base, I need to get a 1-day pass by standing in line for 30 minutes, getting screened by the ID clerks, and having the same 10 questions answered every day. There’s shopping, restaurants and a beach on base, so it’s easy to avoid leaving the grounds if going out is a hassle. Once you’re through the gates, there’s miles of military owned nothing before you reach the nearest civilization. Gas is expensive here and the drivers aren’t very good, which makes travel less appealing. If you do actually make it someplace, you can’t drink (since you need to drive back; a taxi is $90+ from the nearest places), the stores are packed, and most places shut down for long lunches and early in the evening. The majority of activities on Guam are swimming, sailing, snorkeling, scuba diving, and hiking. There are plenty of Japanese pillboxes (shown above) and old military ordinance around to keep you finding new stuff. Many of the locales (the military especially) have taken up geocaching, hiding treasure troves along the beaches and in the hills for people to find using GPS coordinates. Beyond that, there are fiestas in the villages, sporting events, clubs, music, and games. A lot of people island hop to the rest of Micronesia, though I haven’t found a way that doesn’t involve an expensive plane ride as of yet. For me, it’s all new and interesting, but for the Navy wives, they’ve done it all by now. After a month being here, they’ve already spent two weeks at the beach, snorkeled a few days, visited the Chamorro village for their weekly BBQ, gone hiking a couple times, and shopped through their entire savings. With the way some of these women talk about Guam and talk about getting off, this seems as much an island prison as a paradise. Several sailors have committed acts of self-mutilation in an attempt to get out of duty or transferred. Most recently, one member of the boat wrapped his car around a lamppost, injuring himself badly enough to be hospitalized and successfully missing the trip. It makes me wonder. Is Guam truly the paradise it’s advertised to be? Yeah, now imagine you don’t have internet! Whoa! Oh PS> It’s my birthday. In the “real world” people get caught up in day-to-day responsibilities and have a tough time rescheduling themselves when the pace slows down. People on vacation often say that it takes half the vacation before they can let go of thinking about work or school or whatever. Considering that the area of Guam is 540 sq. km., that’s more than eight times larger than Boulder, Colorado’s 65 sq. km. And I bet there are students in Boulder who spend four years almost entirely on campus or downtown. Go figure. So, take a break, lie on the beach, look at the sunset, relax and enjoy. Learn to meditate and empty your mind of all thoughts. Go zen. The pace of your travels will pick up soon enough. I’m having no problem with the slower pace, it’s the wives. Plus Craig demanded I stop writing about Basketball. I’m merely trying to point out that there isn’t a whole lot going on to write about out here. I plan on doing some hiking, borrowing an underwater camera for snorkeling, and generally taking it easy. Even if we don’t get off island, there’ll be plenty going on to keep me happy.